Thanksgiving is a wonderful holiday (political things put aside) to celebrate each year with your family and friends. When I was younger, we would all go over to my Grandma's and we'd eat until we were too stuffed to move. Now, as an adult with my own home and dining room, I like to host my own Thanksgiving dinner. The very first year we were in our home, we invited my husband's and my side of the family to come celebrate with us. I don't remember the number for sure, but I think we had 18 people to feed. We had our long dining room table and added a long folding table at the end and we fit snuggly, but we still fit! We haven't had as many people come since that first one, but we still have a pretty big turn out and with that comes a lot of food and each person has that one special thing that they like to eat for Thanksgiving. 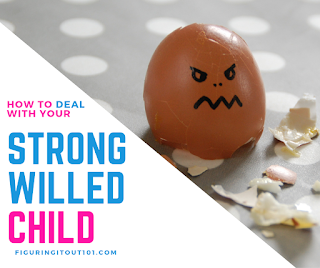 As a parent with young kids, hosting Thanksgiving can be a bit chaotic, but bringing your kids to another person's house can give you more anxiety than hosting Thanksgiving dinner, so I just choose to host it. So how do you make it work for you? If you are hosting a multi-family Thanksgiving, cooking can be expensive and overwhelming. This is what we do in our family. Usually, my mother-in-law will make the turkey, and I will make a ham. From there, we make a list of the dishes that we would like to have and we divide the list in half- or if there are more people joining us, we ask them the chip in by bringing a dish or two to pass. If this appeals to you or if you are just looking for dishes to make even though you are cooking for your family by yourself, here's a list of our easy-to-make dishes that never seem to fail us. You're going to notice a trend and that trend is, if it isn't easy to make, it's not making this list. Breakfast Pizza- What some people forget when it comes to big holidays is that we still need to eat earlier on in the day unless you're going to eat everything around noon, but we usually do our Thanksgiving dinner around 4 or 5 in the afternoon because some of our loved ones still work that day. An easy way to feed everyone is to make this Breakfast Pizza. It's super delicious and very easy to make. 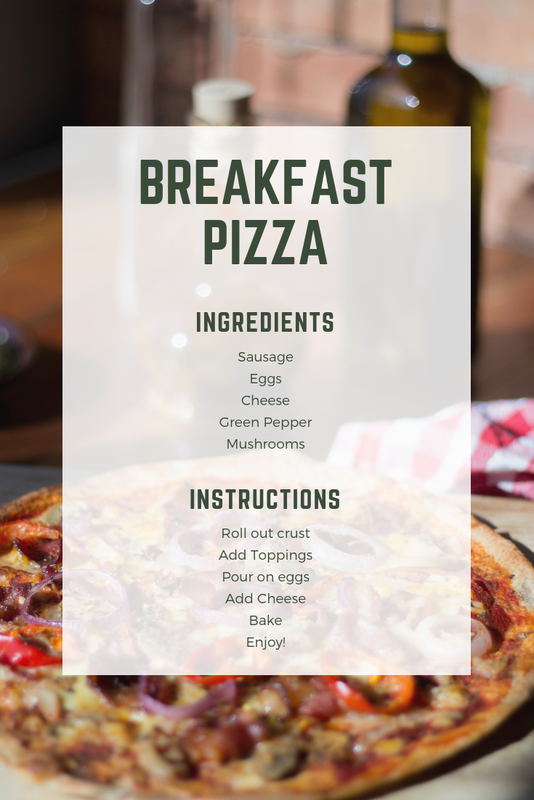 Click Breakfast Pizza for recipe. 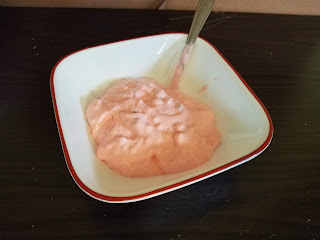 Green Stuff- Ok, the name sounds really weird and it's not very descriptive, but growing up, my grandma made this Jello salad (made with cottage cheese and Jello) that was absolutely delicious. It's not quite a dessert so we sometimes ate it with the food or we sometimes saved it for dessert time. This is a dish that you can and SHOULD make the night before so it has time to set. Click Green Stuff for recipe. It's super easy to make and you can make it several ways. For instance, in the pictures, I made it with strawberry jello instead of lime. 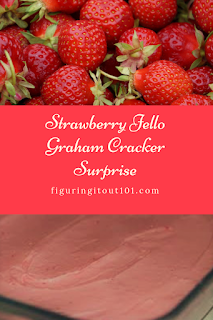 Strawberry Jello Graham Cracker Surprise- Since we just introduced a dish that should be made the night before, here is another one. This dish was a complete accident when I came up with it, but the accident turned into a marvelous creation. If you like Jello Pretzel dessert, you'll probably like this too. 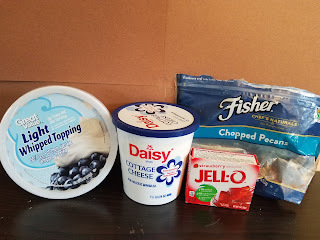 With everything blended together, it gives a rich, smooth taste with your favorite jello taste and the fruits added make it somewhat healthyish, right? It's not a pie or a sea foam salad, but it's still absolutely delicious and easy to pass around your table. 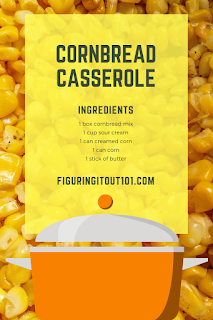 Corn Bread Casserole- With very few ingredients and even fewer instructions, this is the perfect side dish to add to your Thanksgiving meal. 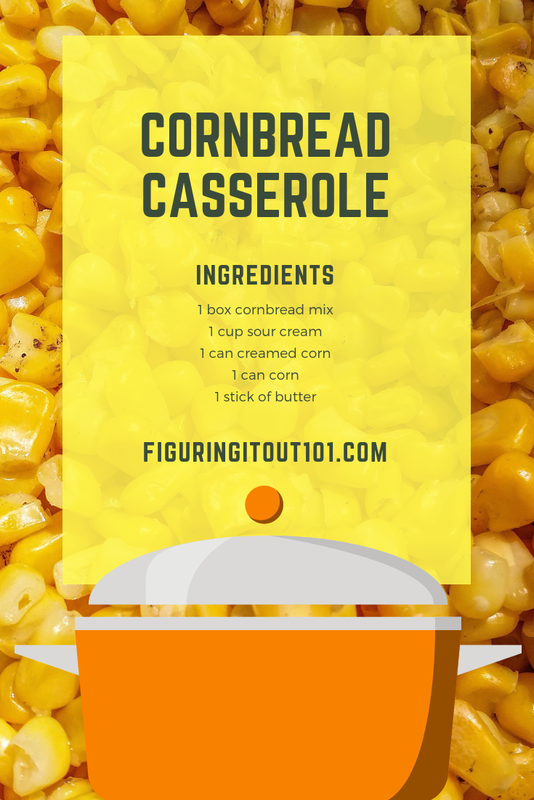 Cornbread is such a great comfort food and having it mixed with these other ingredients, your taste buds will be sure to love you. Click Cornbread Casserole for recipe. Green Bean Casserole- This dish is probably my favorite in the side dish category. The dessert category is a whole 'nother thing. Before I moved on my own, my mom always made this casserole and I always thought that it must have been really difficult to make since it tasted so good. I was completely wrong. I kind of feel like maybe my mom had this smart idea to make cooking seem hard so that we felt thankful for her and to show our gratitude, we did the dishes. Who am I kidding, the dish washer did that for us. 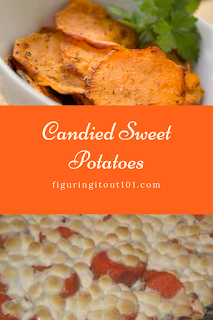 Candied Sweet Potatoes- As long as I can remember, I have always loved sweet potatoes. My mom, who didn't cook often, would make this dish every Thanksgiving meal and if it didn't get made, I protested. Sweet potatoes, which are already sweet, hence the name, become even sweeter with this recipe. The ooey, gooey marshmallows add a great flavor and texture and the pecans can be optional- When I make it, I add them to one side so those who don't like the nutty flavor and texture can enjoy the potatoes without them. Click Candied Sweet Potatoes for the recipe. 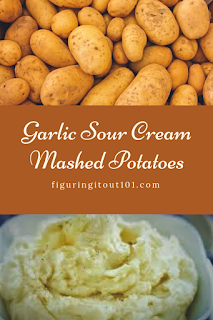 Garlic Sour Cream Mashed Potatoes- When I asked my brothers-in-law what side dish they wanted and had to have for Thanksgiving, mashed potatoes was the number one answer. Although I leave my mother-in-law in charge of potatoes and she makes hers a little differently, you still can't go wrong with this recipe. Click Garlic Sour Cream Mashed Potatoes for recipe. There are SOOOO many more dishes that you can make for Thanksgiving, but this is the easy list. Everything else that gets made for our family goes up in difficulty and I leave those dishes to my mother-in-law because she has the recipe and if it isn't easy, I don't want to make it. Thanksgiving is a time to feel thankful and I know that for me, it's hard to get into that mindset when I spend the whole day in the kitchen while the rest of the family is somewhere else in the house. You can prepare many of these dishes the night before and warm them up in the oven usually about a 30-45 minutes before the meal is to start. Just remember, that when making these dishes, make sure that you have time to prepare them and also have fun with your family. Because these are so easy, don't stress out and enjoy the day. If you want desserts, order a pie or something else that is already pre-made and only needs to sit on the counter to thaw. Thanksgiving is a time to be thankful and to be with family. If you're too stressed out, you're doing it wrong, so do it right. Enlist some help! Have your kids set the table. Include them so that the feel responsible and like they had a part in making this celebration. Also, because I'm so grateful for every single one of you, I've made this FREE Thanksgiving checklist just for you! Thanks for sharing your recipes. I'll have to look for some of mine so I can share, too. Most of these I know from our Thanksgivings. I like the breakfast pizza idea. I need to make that instead of cinnamon rolls. Oh its soooooo easy to do! If they are simple and still taste good, they are the recipe for me. Great ideas for some side dishes! I know my family members would really enjoy these. Wow, these are great dishes ideas to make for Thanksgiving and I can say that I will go to Garlic Sour Cream Mashed Potatoes. Mashed potatoes are a must in our house. I Love cooking.. definitely I'll try these recipes. Thank you! I'm a vegetarian, so I'm all about the sides on Thanksgiving. I love the mix you've presented. A little sweet, a little savory...a whole lot of yum! Thanks! I hope there is something here that you'll enjoy! Now these sound like some wonderful side dishes to make at a special time of year. I love that you could really make all if you have a big crowd coming offering something for everyone. We always have WAY too much because we have some picky eaters. There's definitely something in here for everyone. These are all great ideas, thanks for sharing! I always love to make broccoli casserole also, which is usually a big hit. Garlic mashed potatoes are a must! Happy Thanksgiving! My mother-in-law makes a broccoli casserole that's really good. That usually gets served each year at our dinner. 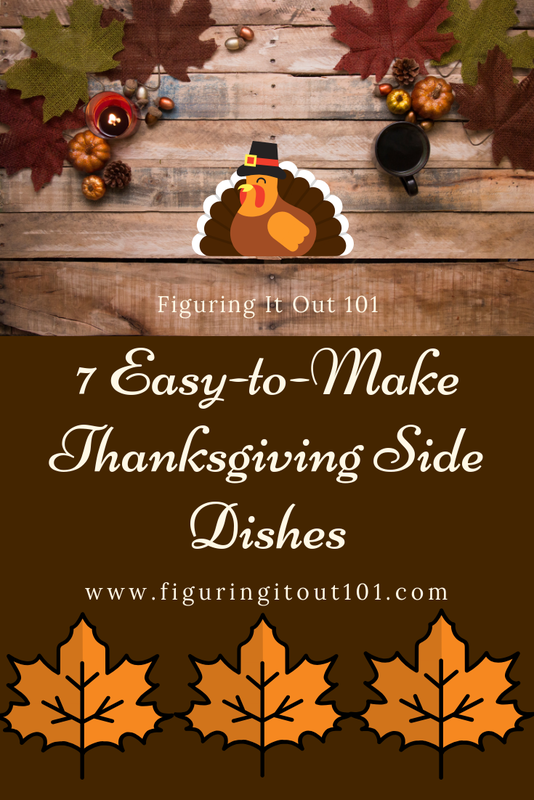 Thank you for these side dishes ideas for thanksgiving. My niece loves mashed potatoes! I'm the only one in my house who loves them, so I only get them on Thanksgiving or if we go out, but we rarely go somewhere to sit down and eat them. These sound like such great side dishes! I wish we did huge family/friends gatherings to be able to put on a great spread! What's good about these side dishes is you can pair them with regular meals, too. I like to eat the cornbread casserole with chili or sausage and potatoes. These are the perfect side dishes for Thanksgiving. I like to make different things every year to keep the whole family guessing. I stick to what I know, although, my kids don't like anything.